The Global Volcanism Program has no activity reports for The Barrier. The Global Volcanism Program has no Weekly Reports available for The Barrier. The Global Volcanism Program has no Bulletin Reports available for The Barrier. 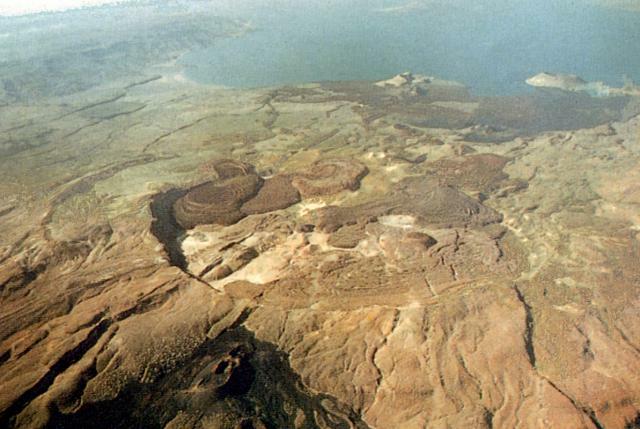 The Barrier volcanic complex separates Lake Turkana from the broad Suguta Trough to the S, the site of a former lake. The volcano is comprised of four overlapping shield volcanoes, with the youngest, Kakorinya, located over the axis of the East African Rift. Kalolenyang volcano lies W of Kakorinya, and Likaiu West and Likaiu East are located to the ENE. A 3.8-km-wide summit caldera was formed at Kakorinya about 92,000 years ago. Youthful-looking trachytic and phonolitic lava domes and flows erupted within the caldera and along its ring fracture fill much of the caldera floor. Early Holocene fissure-related scoria cones and lava flows dot the S and N flanks. Solfataric fields are located within the caldera and on the W and S flanks. Historical eruptions from Teleki's and Andrew's cones on the N and S flanks, respectively, have produced basaltic explosive activity and lava flows during the 19th and 20th centuries. Campbell Smith W, 1938. Petrographic description of volcanic rocks from Turkana, Kenya Colony, with notes on their field occurrence from the manscript of Mr. A.M. Champion. Quart J Geol Soc London, 94: 528-531. Dodson R G, 1963. Geology of the South Horr area. Geol Surv Kenya Rpt, 60: 1-53. Dunkley P N, Smith M, Allen D A, Darling W G, 1993. The geothermal activity and geology of the northern sector of the Kenya Rift Valley. Brit Geol Surv Res Rpt, SC/93/1: 1-185. Ochieng J O, Wilkinson A F, Kagasi J, Kimomo S, 1988. Geology of the Loiyangalani area. Rpt Mines Geol Dept Kenya, 107: 1-53. Smith M, 1991. (pers. comm.). Williams L A J, Macdonald R, Chapman G R, 1984. Late Quaternary caldera volcanoes of the Kenya Rift Valley. J. Geophys. Res, 89: 8553-8570. There is no Deformation History data available for The Barrier. There is no Emissions History data available for The Barrier. A northward-looking aerial view shows the summit caldera of Kakorinya volcano of The Barrier volcanic complex with Lake Turkana in the distance. The 3.8-km-wide summit caldera was formed about 92,000 years ago, and youthful-looking post-caldera lava domes and flows fill much of the caldera floor. Fresh-looking lava flows and tuff cones occur along the shores of Lake Turkana. Teleki's Cone on the northern flank and Andrew's Cone (lower left foreground) on the southern flank have been the source of historical lava flows. Photo by Martin Smith, 1993 (copyright British Geological Survey, NERC). There are no samples for The Barrier in the Smithsonian's NMNH Department of Mineral Sciences Rock and Ore collection. Large Eruptions of The Barrier Information about large Quaternary eruptions (VEI >= 4) is cataloged in the Large Magnitude Explosive Volcanic Eruptions (LaMEVE) database of the Volcano Global Risk Identification and Analysis Project (VOGRIPA).